The Johnson Gallery. L.A. Santa Fe Gallery. Exhibition Ten Twenty-Two. Gallery Machbitz. San Luis Artistsâ€™ Gallery. Compact Gallery. Art Lives Here. Arternatives. Rococo. McConnell Gallery. Ramos Gallery. Kolliner Gallery. Courtyard Gallery. Isis. Kidzart. Nature Gallery. Landon Gallery. August Editions. Lâ€™Artiste Gallery. Firewalk Gallery. What do these names have in common? Theyâ€™re all San Luis Obispo fine-art galleries that have gone out of business in the past dozen years. Why, as a rule, do galleries in SLO Town fail? And what are struggling galleries doing to survive and thrive? 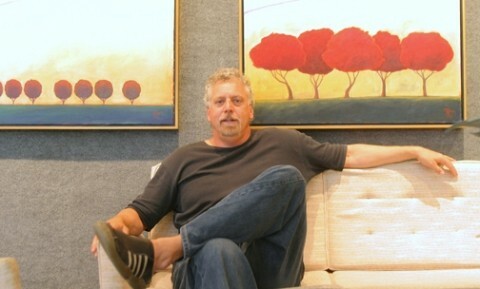 BIG DOG: Ralph Gorton of Just Looking Gallery runs SLO Towns most successful gallery. # oblivion. Without question, the big dog in SLOâ€™s gallery scene is Ralph Gortonâ€™s Just Looking Gallery, which opened its doors in 1984. Currently located on Higuera Street, just inside the Mission Mall, the gallery has evolved into the most successful purveyor of fine art in the city. It began in a space near the creek side of the mall, selling mostly posters and numbered-edition reproductions. But, Gorton said, about 85 percent of what now hangs in the Higuera Street gallery is original artwork. The business also offers framingâ€”a practice that also subsidizes other local galleries, such as the Frameworksâ€™ SLO Art Galleryâ€”but Gorton explained that framing is but a small part of his galleryâ€™s income. â€œI donâ€™t have a formula for success or a business plan,â€? said the gregarious Gorton, settling into one of the modernist chairs in his gallery. â€œWe wing it as much as anything, but we know how to wing it, and we know how to pick talented artists.â€? Because Gorton also has a successful publishing company, rumor has it that business subsidizes his galleryâ€”but thatâ€™s not so. â€œForget the publishing,â€? he said. â€œThatâ€™s a completely separate entity and has nothing to do with paying the Just Looking Gallery bills. Look, I know what you want me to tell you,â€? he continued, â€œthat galleries fail because of high rent or a lack of parking, but that has nothing to do with it. I pay the highest rent of anybody. But I have a prime location and talent and passion. My mother said, â€˜Ralph, you have a good picker,â€™ and thatâ€™s what it comes down to. I know how to pick art that sells. Take Mark Ruzinski, for instance. Heâ€™s new to the area, a plein air painter painting local scenes, and last year I sold 130 of his paintings, and theyâ€™re priced right: about $750 for an original framed oil. â€œHereâ€™s another one of our artists, Ron Rogers, whoâ€™s from Utah,â€? Gorton elaborated. â€œHeâ€™s also in galleries in Park City, Palm Springs, Vail, New York, and here in San Luis Obispo. And do you know who his agent is? Yours truly. Itâ€™s about developing relationships. 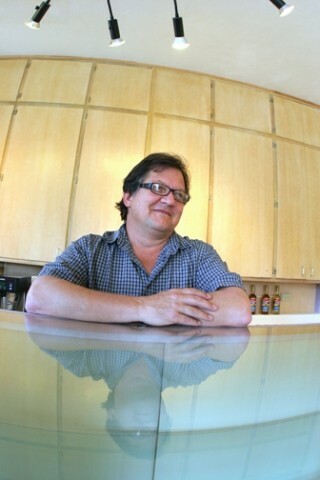 It also helps that my gallery director, Ken McGavin, brings a fresh perspective. Heâ€™s as talented as I ever was at 25â€”maybe more soâ€”and heâ€™ll eventually be an owner here.â€? But what does Gorton think of the innovations other galleries employ to stay in business? â€œIâ€™m only trying to do one thing well, which is sell fine art,â€? he said. â€œI donâ€™t want to sound too elitist, but these days, every hair salon has art on the wallsâ€”but the art youâ€™ll buy in a hair salon is about as good as the haircut youâ€™ll get in our gallery. â€œAnyway, not only has our gallery evolved, but our community has evolved,â€? he continued. â€œSan Luis is a much more affluent place than it was in 1984. Still, itâ€™s about passion and talent. Iâ€™m here at 8 a.m. every day, and I know Iâ€™m beating other gallery owners to work by two hours. The location helps, too. When we were remodeling this place before moving in, we took a 20-minute lunch break, and I decided to count how many people walked down Higuera Street: 108. Do you know how many turned down Mission Mall? Four. Four out of 108! Location, location, location. That, and being a good picker. â€œIâ€™m just a lucky guy,â€? Gorton summed up. â€œI have one of the best jobs in the world, and Iâ€™m lucky to be living in San Luis Obispo.â€? For every Just Looking Gallery, however, there are a dozen failures. Even a long-running business like the Johnson Gallery, which opened in 1985 as a frame shop with fine art, had to radically transform itself to stay in business. # â€œI had three businesses going there,â€? 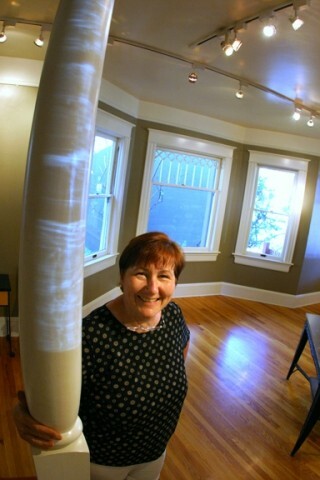 said Gail Johnson, who recently closed her Marsh Street gallery and relocated her frame shop to Sueldo Street. â€œWe had framing, the gallery, and gifts, but I spent the last two years with a new bookkeeper assessing what parts of business were profitable and determined I had to perform surgery and cut out what wasnâ€™t working.â€? The gallery simply wasnâ€™t making money for Johnson, who grew tired of having to subsidize the business with framing and gifts. â€œI wouldnâ€™t ask, â€˜Why didnâ€™t we survive?â€™â€? she said. â€œIâ€™d ask, â€˜Why didnâ€™t we thrive?â€™ You can survive if youâ€™re willing to put in the time and sell your soul. It became too much. With Art After Dark [SLO Townâ€™s gallery-wide open house], we were always on deadline, never able to make the artists happyâ€”and if youâ€™re not selling their work, they think youâ€™re not working. â€œThe problem with galleries is you have to pay the bills, and the bills are so high,â€? Johnson continued. â€œYou pay $3 per square foot, triple net, which is about $3,500 a month just to sit there. Then you pay someone $10 an hour for seven hours, which, after taxes, is $100 a day. Itâ€™s impossible unless you sell high-ticket items, and you have to sell lots of them. I think the plight of galleries is the same as all small businesses: Youâ€™ve got to sell your product to pay the bills.â€? Johnson got the idea to create a fine-art gallery in 1995, thinking that she could tap into a burgeoning collectorsâ€™ market. â€œI used to see people coming in to have me frame things they bought in Carmel or Santa Monica, and I had great art on the walls, but I didnâ€™t have status, which is when I realized I had to sell artâ€”not in a frame shopâ€”but sell framing in an art gallery. I was trying to get people to buy art here instead of out of town. I think people with money want a place with a little snob value, and I could never catch up with that flow of snobbery.â€? Johnson also feltâ€”as do a lot of gallery ownersâ€”that people took advantage of the amenities she offered but didnâ€™t support the gallery monetarily. # â€œKeeping art in the public eye isnâ€™t rewarded with some sense of loyalty and need to buy, and then art becomes entertainment,â€? Johnson lamented. â€œI was trying harder and harder to lure these people in, but all I succeeded in doing was turning them into eaters. When I finally decided to close the gallery, I wanted to go out with bang, so I did live music during Art After Dark for several months. I had people who would get there early, park in the best spot, wait on the lawn, and then walk down the driveway and sit on their fat asses and drink free wine and listen to free music â€¦ and never buy a single thing.â€? Unlike Johnson, who was born and raised in San Luis Obispo and created her gallery out of a pure passion for the arts, Shelley McConnell opened the now-defunct McConnell Gallery on Monterey Street with a sound business plan. â€œI had a gallery in Sacramentoâ€”one thatâ€™s still open and successful thereâ€”and I pretty much replicated what we were doing in Sacramento and brought it here,â€? 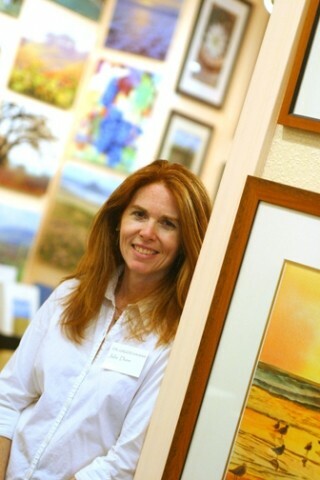 said McConnell, now president of the SLO County Arts Council board of directors. â€œAnd hereâ€™s what I learned: Sacramento has 2 million people, and we have 250,000. I thought tourism would make up for the shortfall, and the tourists who come hereâ€”well, letâ€™s just say that they tended to buy Thomas Kincaid stuff. So I think thatâ€™s it. Thereâ€™s a lot of wealth here, no shortage of money, but people tend to buy out of the area.â€? Thatâ€™s not to say McConnell didnâ€™t sell a fair amount of art. â€œI did well for hereâ€”$20,000 to $25,000 a month in sales here. But thatâ€™s not enough to make a living. The rent was high, and I did a lot of advertising, and once I did all that, there wasnâ€™t enough for me to live on.â€? She also couldnâ€™t conceive of how to change the market she found herself in. â€œI didnâ€™t think any amount of time was going to make my gallery do any better than it was doing,â€? she explained. â€œI think I finally realized that when I went on one of those home tours, and we visited a beautiful 10,000 square foot filled with beautiful antiques, and there wasnâ€™t one piece of original art on the walls. Not one! It was all framed posters in aluminum frames.â€? SLO County Arts Council Executive Director and Cuesta College photography instructor Marta Peluso tends to agree with Johnson and McConnell: â€œI think it comes down to a lack of patronage. I donâ€™t mean in the sense of attending gallery events, as there is a large audience for visual art in SLO County. To witness this phenomenon, visit most galleries on an evening of an opening reception or Art After Dark. I remember when Art Lives Here and Compact galleries opened, there were people spilling out of the spaces filling up the nearby sidewalks. When I directed the gallery at Cuesta College, weâ€™d regularly get over 200 people at a reception. â€œBut, for as much appreciation and enthusiasm county residents have for art, there is a disconnect when it comes to buying works of art,â€? Peluso continued. â€œA clothing store wouldnâ€™t stay in business very long if people only came to look at the clothes. When a good restaurant opens, one has to eat there for it to stay in business. The same with art galleries. Until residents start patronizing their own art galleries, it will be very difficult for themâ€”especially galleries that offer art thatâ€™s challenging to popular culture aestheticsâ€”to survive.â€? # themselves and their businesses in an effort to survive. Peter Steynbergâ€™s Steynberg Gallery Tea and Coffee House is a good example. The Monterey Street gallery began selling African artâ€”masks, sculpture, and the likeâ€”6 1/2 years ago. Later, he also began to show fine-art paintings, often depicting challenging and political work. Sales trickled in, but he felt as though many of his opening reception â€œpatronsâ€? were really there for a free meal. â€œI have people who come to every art opening, and it feels like all Iâ€™m doing is giving away wine and food. With the coffees and teas, weâ€™ll always have a little money coming in, and if someone wants to eat something they can just pay for it,â€? said Steynberg, whoâ€™s originally from South Africa but moved his family here 15 years ago. Steynberg owns the building heâ€™s in and his family lives in the apartment above it, but like many struggling SLO residents, a sizeable mortgage payment looms over him very month. â€œI decided Iâ€™m not going away,â€? he said. â€œEven if I have to sell coffee to survive, Iâ€™m not going away. Iâ€™m just trying to find the right mix of business. You have to keep on reinventing yourself. This is going to help us run the gallery better. I wonâ€™t have to limit my art and wonder if itâ€™s commercial enough.â€? Steynberg isnâ€™t alone in his tenacity and creative desire to survive. The three owners of The Gallery in the Networkâ€”Julie Dunn, Rosanne Seitz, and Linda Lewisâ€”created a business model that not only sustains them but also offers other artists a chance to be seen: They essentially rent out space to other artists. â€œWe rent space at a reasonable rate in six-month contracts, and we only take a 15 percent commission on the works we sell,â€? Dunn said. â€œThe leased space helps pay our rent, and the commission pays for the little incidentals like utilities or food for opening receptions. Everyone is an independent. We pay our own sales tax, so there are no employees. A few of our artists might work a little in exchange for reduced rent. â€œThe whole idea is to help people be successful, and we think we have a good model for artists who want to sell their stuff,â€? added Dunn, whoâ€™s been in the Network for four years. Ali Semon, owner of Frame Works on Marsh Streetâ€”which houses the SLO Art Galleryâ€”has also made a commitment to local artists, even though that commitment may not be financially advantageous. â€œWe made a commitment to support local artists by providing an avenue for promotion, showing, and selling of their work,â€? Semon said. â€œWe have a choice as a gallery to show reproductive art on paper that is marketable and comes from outside the area, but we have made a conscious decision to show original work from local SLO county artists. Itâ€™s difficult to stick to that decision. Thereâ€™s significantly more money to be made in reproducible artwork rather than original work by local artists. But weâ€™re measuring our success by the level in which we promote our numerable talented local county artists.â€? Yet another innovator is Jason Mayr, whoâ€”with wife Cindyâ€”runs the Mayr Gallery currently located on Morro Street, though not for long. Theyâ€™re moving to a larger location on Granada Street, combining Jasonâ€™s art studio and teaching facilities with a larger gallery space. Mayr, a talented still life and landscape painter, offers painting lessons, which help bring in a steady income. Due to a small studio space, however, he could only accommodate six students at a time. His new location will fit up to 15 students. Jason also noted that though their gallery is located downtown, itâ€™s off the beaten path, which brings in very little foot traffic. â€œWeâ€™re paying downtown rent without downtown benefits,â€? he said. Another downtown gallery off the beaten path is the Jeff Claassen Gallery on Higuera. The upstairs gallery boasts an entrance right next to Moeâ€™s BBQ. The 28-year-old maverick sells mostly his own workâ€”pop art with an edgeâ€”which he keeps reasonably priced. â€œThereâ€™s nothing like this in SLO,â€? he said of his hole-in-the-wall space. â€œIâ€™ve had people come in and say, â€˜You should really raise your prices,â€™ but I always say, â€˜Then you wouldnâ€™t buy it. If it was $100, youâ€™d say no, but at $60 â€¦ .â€? Clearly, many local gallery owners are making a go of it, even if theyâ€™re working outside of the traditional gallery model. Even though galleries seem like losing propositions in SLO Townâ€”at least in their purest senseâ€”the challenge doesnâ€™t stop people from trying. The newest entry into the local gallery scene opens next month in the Creamery, when Anam Creâ€™ owner Shevon Sillivan joins forces with Nicole Watson and Stephanie Raser to open Shee, next door to Anam Creâ€™s pottery studio. They plan to carry work by out-of-the-area artists, such as Salma Arastu and Santiago Martinez, and prints by Australian artist and former SLO Town resident Catherine Able, plus work by African artist Abbey Onikoyi, who has a stand-alone gallery in the Creamery. They also plan to show their own work. â€œWeâ€™re going into it optimistically,â€? Raser said, â€œand thereâ€™ll be three of us.â€? Glen Starkey loves artâ€”even the bad stuff. Tell him he has bad taste at gstarkey@newtimesslo.com.